New: No Paypal account required! Just click "Pay using your credit or debit card." Despite hopes that a UN-backed unity deal might bring Libya's two rival governments back together, fighting in continues against the so-called "Islamic State" (ISIS/ISIL) and other religious hardline groups. Though most of the major cities have stayed in the same hands since last summer, there have still been several important changes to territorial control. See all this and more on the latest update to PolGeoNow's concise, professional Libyan Civil War control map, which comes with a timeline of changes since our previous Libya map report last August. Want to see before you buy? 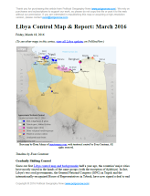 Check out our most recent FREE SAMPLE Libya map! Up-to-date map of current territorial control in Libya, color-coded for the internationally-recognized Tobruk government (supported by General Haftar's Operation Dignity), the rival Tripoli-based GNC government (supported by the Libya Dawn militias), "Islamic State" (ISIS/ISIL) extremists, and other religious hardline groups. Locations of recent fighting and military operations, including Benghazi, Ajdabiya, Janzur, Bin Jawad, and more. Detailed timeline of important events and changes to territorial control since August 21, 2015, with all sources cited.